iCall is another tool you can use to make free internet phone calls. With iCall, you can make free calls from PC to phone using their free software. You can make calls from anywhere in the world with your computer, but for the FREE call, the number you call must be in the United States or Canada. You can't make free phone calls using iCall if you're calling outside the US or Canada. 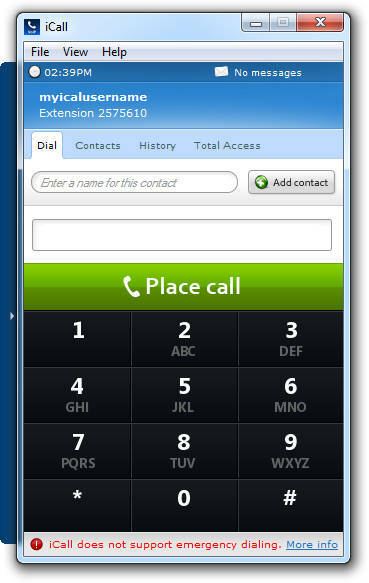 iCall is available as a free desktop application for Windows, Mac OS X, or Linux and as a free iPhone app. Free phone calls will be disconnected after a short five minutes but you can call the number back again as many times as you want. You will also hear an advertisement before each call that's around ten seconds long. A flash-based version of iCall is also available on their website but free calls here are limited to three minutes.